Girlhairdo.com teaches you how to wash your synthetic hair pieces/wigs. Synthetic wigs get dirty and, like real hair, they need regular shampooing to look their best. How often one should wash her wig differ from person to person, some say as soon as the wig has been worn 10 times, while others suggest 30 wearings before shampooing a wig. Washing a wig too often can actually cause it to wear out faster. Other factors may also affect how often a wig should be washed. If you sweat alot or are around strong ordours or perfume, or smoke smell, you might have to wash the wig more often. If you are wearing a wig sitted in an air-con environtment and your wigs is clean after wearing you do not need to wash it. I would suggest washing a wig when it starts to smell, or loses its shine or its clumpy with sweat /dirt. tips: I wear my synthetic hair pieces or hair wigs after shampooing my own hair, so the oil and dirt on my hair doesnt get to the wig, and I try not to let the hair pieces get into contact with perfumes, real hair products, or even my own sweat. I am mostly in air-con environment so I almost never wash my wigs or hair pieces. But lets say if I am wearing it to a bbq or a steamboat or party, after that I would air my hair wig on a WIG STAND ( available on Girlhairdo.com / under wig care) , usually after the next day or a few days it usually doesnt smell anymore. If it still smell bad, its time to give your wigs a nice shampoo. Brush your wig before washing it so the hairs don't get tangled in the water. If the wig hair is knotted, spritz it with wig spray to lubricate the fibers. Using your fingers, tease apart any large knots. Start brushing the wig at the ends and work your way the roots until you've removed all of the tangles. For best results, use the girlhairdo wig brush which is available in our store brush to protect the wig fibers from breakage. Fill a sink or tub with tap water or cool water. Add about 1 to 2 tablespoon of synthetic wig shampoo and then foam. Submerge the wig fully in the soapy water, then swish it around for a minute. If the wig is very dirty, let it soak for as long as 5 to 10 minutes, then swish it around again. After you've shampooed the wig, you're ready to rinse and dry it. 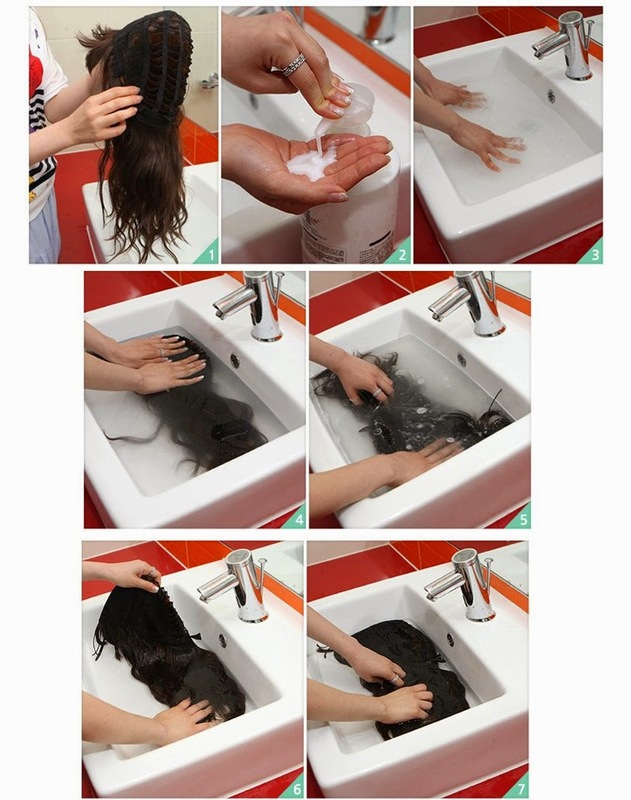 Remove the wig from the soapy water, then rinse it under cool, running water until you see no more suds. Pat the wig with a towel to absorb as much water as possible. Don't squeeze the wig between the towel or rubbing it, because these actions may tear the wig fibre or damage it, Spray your wig with a small amount of conditioning spray, then use your fingers to spread the spray through the hair. 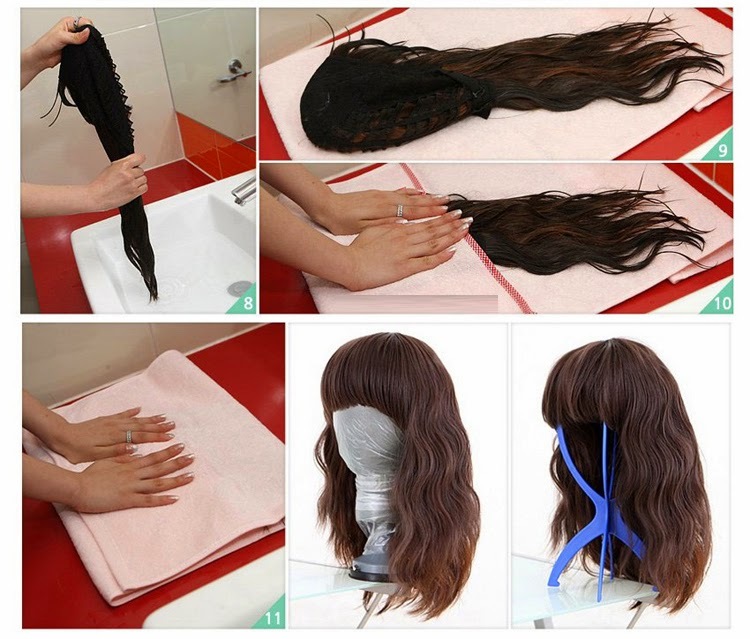 Place the piece on a wig stand to dry, only brush the wig when the wig is fully dry! The synthetic wig should be brushed with a Synthetic Wig brush. One tablespoon of wig shampoo should be added to a sink of cold water. The wig should then be put into the sink and moved around a little bit, but not rubbed. The wig needs to be rinsed in cold water until all the shampoo is out. The wig should be patted dry without being rubbed down or squeezed. 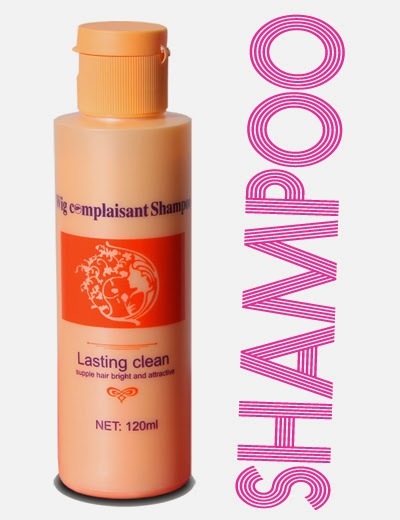 A conditioning spray(available in girlhairdo store) can then be lightly applied to the wig. leave wig to dry on a wig stand. The wig should only be brushed after it has dried completely.